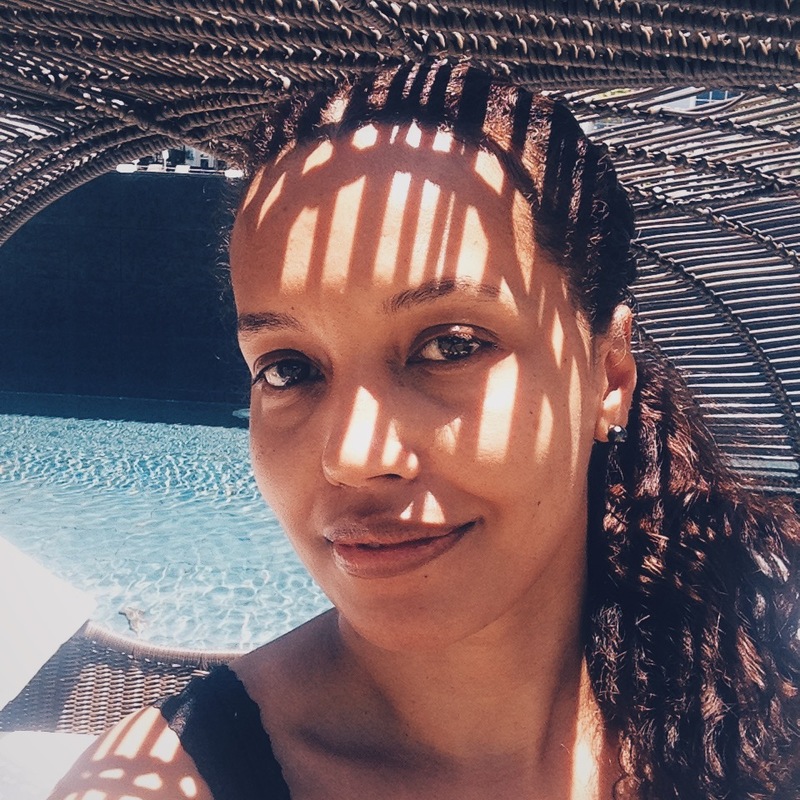 Hey Loves I have been wanting to share my Morning and Night skincare routine with you for ages. It’s been one of those things when all of a sudden it pops into my head to do and then I realise I’ve either run out of 1 or 2 of my products or I just introduced a new product into my routine and need time to test it out…..Anyway, finally, we are here!! I will try to keep this post as short as possible and to the point because I do tend to go off on a tangent at times. For your reference I have combination skin, throughout the day my skin does get very oily especially in my T-zone area and at the same time dehydrated from being in and out of aircon. I hope you will find some of this useful and if you think I have left something out or you have a question about any of the products that I use please feel free to leave a comment below, so without further ado my Morning & Night skincare routine. Liz Earle Cleanse & Polish Hot Cloth Cleanser- I cleanse my face every evening using my old faithful. I make sure my skin is dry before applying, I then take one pump of product into my hand, rub my hands together then massage into my skin. I leave for a minute or two on my skin before washing off with a damp muslin cloth. The Body Shop Himalayan Charcoal face mask- I don't do this on a daily basis, at the moment it’s once a week but I really need to start getting myself into the habit of doing it at least twice a week. This is a newish product for me I’ve been using it for about 2 months now and can honestly say I have seen a significant difference in my skin. I apply this in the evening after I have cleansed my face and make sure my skin is completely dry before applying. With the application process, I have found it much easier to apply with an old makeup brush as it seems to spread on more evenly on my face and it’s just less messy. I then leave to dry for about 10-15mins sometimes even longer when I'm distracted doing bits round the house as you do. 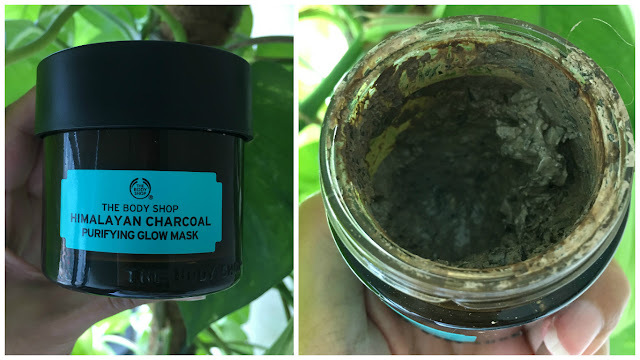 Once the mask is completely dry I run my hands under the tap and pat onto my face and then start to massage the scrub like formula into my skin. After that, I then leave to dry for a further 10 min approx. Again once the mask is completely dry I can now wash the mask off my face. Tip* I do find the little bits in the mask quite stubborn to get off so with the help of a sponge or muslin cloth it makes life a whole lot easier when you are trying to wash off this mask. 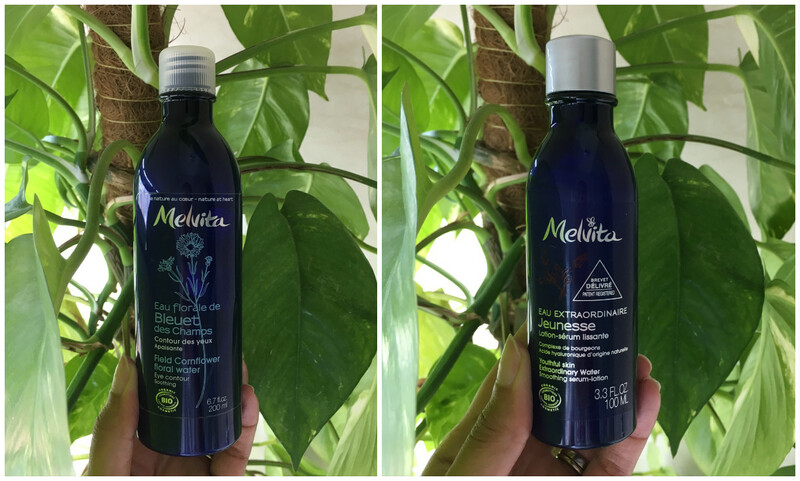 Melvita Organic Cornflower floral water- I bought this product along with the next step 5 in my skincare routine because of its soothing properties it is very cooling around the eye area and I find it does remove any makeup still left after cleansing. I soak a cotton pad a gently rub over my face and neck. I have only been using for about a month now and so far so good however having said that I would need to use it a bit longer to tell you if there is a real difference. I put 2-3 drops in my hand, clap my hands together so the serum is spread between both hands then I pat into my face and neck. Melvita Avocado Oil- The final step in my night time skincare routine. This product has been a game changer for me, I bought this along with the Cornflower floral water because they were two products that concentrated on the eye area which has always been a concern for me and I had been on the lookout for something new to try along the organic route. I am already on my second bottle of this stuff and cannot recommend it enough. I only apply it in the evenings and when I wake up in the morning I can see straight away my skin is looking a lot plumper and smoother. I put one pump into my hand, rub my hands together to warm it up a little then massage onto my face, neck and décolletage area. Witch Gentle Exfoliating face wash- Out of all my skincare products, this has been the one I have been using the longest. I have tried MANY different face washes over the years and I always end up coming back to this one. I find the beads and the formula are not too harsh, not too gentle, my face always feels super clean after using this. In the morning I always wash my face in the shower- it is part of my shower routine. Like any other facewash, I put one pump into my hand and then massage onto damp skin and rinse it off immediately after. I apply both these products in exactly the same way as my nighttime routine. Liz Earle Skin Repair Moisturiser light- Again this is a product I keep coming back to. I find it's the right balance for my skin. It doesn't leave my skin feeling clogged up and greasy after applying and at the same time my skin doesn't feel like it's lacking moisture. There's not really much else I can say about this product apart from when it is missing from my skincare routine there is a change and not a good change in my skin. It's a hard one as I haven't found an alternative moisturiser yet for when I do run out as Liz Erle is not available to buy in Malaysia. So if you do have any recommendation please so share. One pump of this is the right amount to spread evenly over my face and neck. *Tip- When I apply any moisturiser or oil I massage in an upward motion- apparently it helps prevent wrinkles...so I am told....or I should say here is hoping. Simple Revitalising Eye Roll-on- Now this eye roll on I bought at an airport because my eyes were seriously dry and in need of cooling down. On a positive it is very cooling for my eyes but if you asked me if I have seen any improvements using this product I would have to answer no. So what I have done is include in this post an empty tube of my Alpha H The Absolute Eye Complex because this has been the ultimate eye treatment for me nothing has come close. I do suffer from dark circles, puffiness around the eye area and for some reason, whatever is in the Alpha H Eye Complex formula those problem areas are considerably reduced. With the Simple Eye Roll-on, I squeeze a little bit of product which comes out at the end onto the metal roller ball, I then roll on under my eyes in a circular motion for about a 1-2mins per eye. Any remaing prudcut I pat into my skin using my ring finger. With the Alpha H Eye Complex gel, I put 1 pump onto my ring finger and tapped gently under my eyes. That is my full skincare routine done. I hope this post was informative enough and like I said please feel free to ask me any questions on the products I use, also I would love to hear your recommendation's on any eye and moisturiser products that you think I may like.